Yesterday, Russia-backed militants used mortars in the ATO zone to attack Maryinka residential quarters. The attack continued from 19:30 to 21:00. “A search team is working in the town registering the outcomes of the attack. In addition, engineer troops are working in the town. They report unexploded mortar rounds. Updated info on damages of private buildings and other destructions caused by the attack will be known when the search team completes its work,” reported Ukrainian Ministry of Defense spokesman on ATO Colonel Andriy Lysenko at a press briefing at Ukraine Crisis Media Center. In Luhansk sector, militants committed 17 ceasefire violations yesterday. “The enemy attacked out troops near Lopaskyne in the morning with 82-mm mortars and mounted grenade launchers. In the evening, Russian proxies twice shelled our strongholds near Novotoshkivske with 120-mm mortars. Moreover, the enemy attacked Ukrainian troops’ positions near Luhanske and Travneve with various mortars. Troitske area suffered attacks involving 82-mm mortars, IFV weapons, grenade launchers, and small arms,” said Col. Lysenko. Moreover, militants opened small arms fire four times near Krymske, and fired one 82-mm mortar round. Near Zaitseve Russia-backed militants used heavy machine guns, grenade launchers, and small arms in two incidents. “Ukrainian troops responded with fire using weapons not proscribed under Minsk agreements to suppress the enemy,” emphasized Col. Lysenko. In Donetsk sector, militants conducted 16 aimed attacks yesterday. They used 120-mm and 82-mm mortars near Vodiane in the morning, firing a total of 17 rounds. “Moreover, the enemy used 120-mm mortars near Pavlopil. In addition, Russian proxies used grenade launchers and small arms in Pavlopil, Shyrokyne, Avdiivka, Novotroitske, and Vodiane areas. A hostile sniper was active near Novotroitske during the day,” said the spokesman. Near Maryinka Russia-backed militants fired six 82-mm mortar rounds. Moreover, they opened small arms fire three times. Ukrainian troops returned fire. In total, militants committed 33 ceasefire violations yesterday and used Minsk-proscribed mortars 12 times, firing about 60 rounds. ATO troops returned fire in 23 cases. 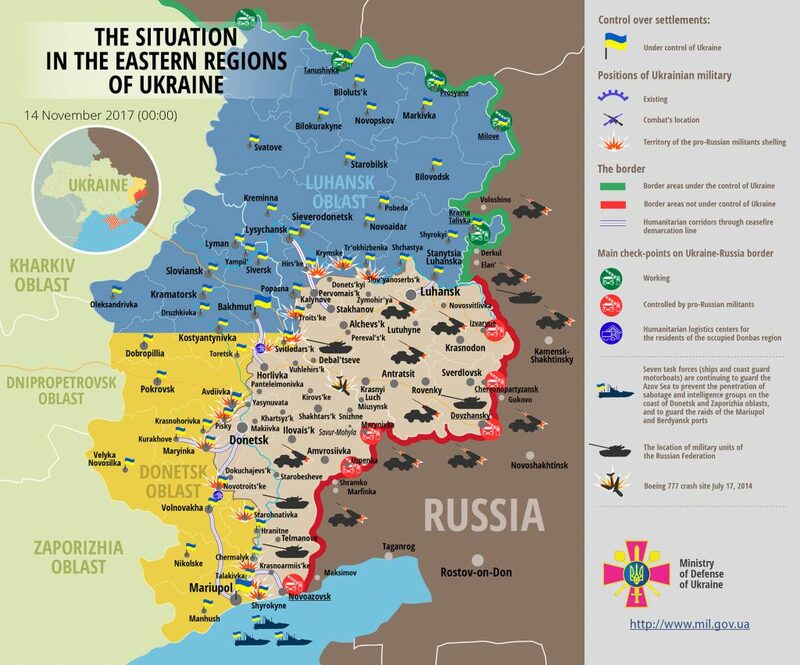 “No Ukrainian serviceman was killed in action yesterday. Two soldiers were wounded in attacks at our strongholds near Maryinka and Novotroitske. The casualties were evacuated to hospital and provided with all necessary treatment,” said Col. Lysenko. Report on the military developments as of November 13 is available here. Interactive data on the shelling: chronology shelling chart and the interactive map.